Now, I wasn’t there to see it in person, but rumor has it that Hillier London’s newest collection of bunny-shaped hair accessories was all the rage among NYFW front-rowers. 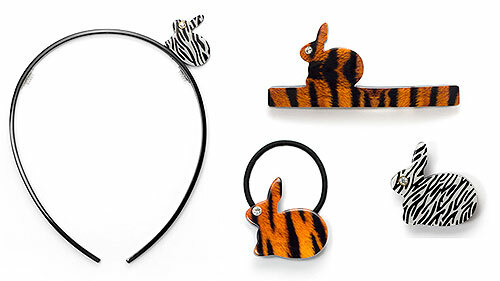 And it’s hardly surprising – the quirky bunny charms, the leopard and zebra print – they’re a perfect addition to polish your look while still (especially when all the other runway-watchers have a great view of the back of your head! HA). But even if you don’t have an event quite as fabulous as Fashion Week to attend, it’s still easy to incorporate these cuties into your fall wardrobe (and beyond)! From pony-hair barrettes to leopard print ponytail holders and bunny-embellished headbands, they’re a pretty chic, low-maintenance way to flip your next bad hair day (or for whenever you wake up too late to straighten your hair…. which is pretty often for me, lately)! Browse the full collection on Hillier London’s official site.